Your lifepath is your life purpose, or spiritual job description. It’s the sum of your date of birth, and is a number between 1-9, or 11, 22 or 33 (the latter are Master Number lifepaths – some people include 44). We change paths each lifetime, depending on what we want to heal. Your lifepath is only 50% of your forecast – your birth and current name/s, pinnacles, challenges and personal years also influence your fate. I discuss these in psychic readings as well as numerology workshops in Brisbane (online classes are in the works). This post is dedicated to the 5s in the world, as well as everyone who loves this number of freedom and originality. Thanks to the lifepath 5’s (Throat Chakra Healers) who inspire me: my telepathic father (who taught me I was infinite), my father-in-law Bob, Caroline Byrd (Soulbyrds), my spiritual mentor since 2009, Toni Reilly (Toni Reilly Institute), who taught me past life regression and has been a huge support, Deva Premal (Deva Premal & Miten), whose music and kindness is beyond words, Fiona McGary (Comedian – see my first stand up set), dear friends Reuben, Waza, Heather (ME Academy – my fave make up artist! ), Carmen F., M.C., Alli Price, Kerri Ryan, Tam Bird, D.W, Kristen Ottaway (Spray Free Farmacy), Elizabeth Gilbert (my first celebrity author – see her reading), and the 5’s who’ve touched my life. Also thanks to the 5,000+ fans on my facebook page The Numbers Queen! You inspired this post! As with all my summaries, it’s taken over a year to create this post. I hope you find it cathartic. To send feedback, email me with Lifepath 5 as the subject, or comment below. To receive more articles like this, like me on facebook at: The Numbers Queen. Also, PLEASE sign up for news and invites on my homepage. Facebook doesn’t always show you my latest posts. Email is the best way for us to stay connected. How do I know if I am a lifepath 5 (aka 5 lifepath)? Find your lifepath by adding your DOB from left to right. Unlike some psychics, I don’t reduce the day, month or year before adding them, as this removes important details. Find your lifepath. In my numerology system, you can be a 5, 14/5, 23/5, 32/5, or 41/5 lifepath. 13/2/2015 = 1+3+2+2+0+1+5 = 14/5 lifepath (also mainly kids) See my article on Karmic 14 numerology for more info. 30/6/1940 = 3+0+6+1+9+4+0 = 23/5 lifepath (mainly adults but some babies are coming through with this vibration). 5/6/1992 = 5+6+1+9+9+2 = 32/5 lifepath (mainly adults) – the most common 5 lifepath I see as clients (apart from 23/5’s). Perhaps this is because my father is a 32/5 lifepath. 29/9/1992 = 2+9+9+1+9+9+2 = 41/5 lifepath (mainly adults, in my experience this is a rare lifepath). Each type of 5 lifepath is different. For alternate descriptions of each, read Dan Millman’s book The Life You Were Born to Live (see my psychic reading for Dan, it includes numerology and palmistry). I’ve also discussed the types in the Famous 5 Lifepaths section. Your lifepath age is a turning point (thanks for the tip Max Coppa), so someone with an 14/5 lifepath may find their confidence and calling earlier than a 41/5. As a 29/11 lifepath I learned numerology at 29, and the ages of 28-30 were full of change – I began seeing 11:11 after 11/11/2011 when I was 30. I give some ‘lifepath age’ examples in the Famous 5 lifepaths section. Why do I call 5 Lifepaths the Spiritual Rebels and Freedom-Seekers? Because I relate numbers to chakras (see my lifepath page), and the 5th Chakra is the Throat Chakra. Our throat/ or neck allows us to ‘stick our neck out’, ‘see both sides of the story’ and is also one of the most vulnerable areas to injury. 5 lifepath’s often incarnate with baggage around ‘being heard’, are learning to find the balance between speaking and listening (especially listening to themselves versus others). 5’s just want to feel free to be themselves, whether that’s in their heads, bodies, careers, home lives or spiritual beliefs. This need for independence can look like ‘rebellion’ to others, especially when they’re still figuring out what they want. As 23/5 Lifepath Jon Bon Jovi sings ‘I ain’t gonna be just a face in the crowd/ You’re gonna hear my voice/ When I shout it out loud/ It’s my life/ It’s now or never/ I ain’t gonna live forever/ I just want to live while I’m alive – see this video. This is why I recommend meditation to 5’s, because ‘wherever you go, there you are’. Until you take responsibility for your inner state, and form a bulletproof connection with your Guides, you’ll keep a) telling yourself what to do, and b) telling others what to do. Not a recipe for peace! 5’s need to commit to their joy, otherwise they feel stressed. See my post about meditation, and how it’s easier than your thinking. It’s not uncommon to meet 5 lifepaths who believe they’ve been burned, persecuted, or hung for pursuing alternative lifestyles in past lives. More on past life regression. As a result, they can show up with a history of restlessness (e.g. keep moving house or can’t sit still), fear of confinement, sore throats, neck pain, a fear of/ or obsession with fire (i.e. the spotlight), and/ or have a tendency to lose their voice. Coughing, and constant throat clearing can also be about ‘needing to get things off your chest’. Even hayfever from a post-nasal drip can suggest ‘inner crying’ that comes from ‘over-reacting to a situation’. I sometimes develop bronchitis or laryngitis when I am upset, not resting enough and resisting change. This happened last November – severe coughing forced me to wean Forrest, and a week later, I fell pregnant with my second child. Spiritually, I must have known another baby was coming (I kept seeing a child in my meditations – read more). My throat is very sensitive, and I used to start choking when doing mediumship work – the energy can be intense, especially if the person died from self-harm. Fortunately these issues clear once I write down my feelings, clear my aura and/ or stand up for my needs. There is a spiritual meaning to every ailment. Read about the Throat Chakra and healing a stiff neck. I also recommend the Australian Bush Flower essences for many health concerns – here’s my reading for Founder Ian White. Homeopathy also helped my cough, when conventional medicine failed. Everything is shiftable, although it can take time to get the results you’re looking for. Still, the feeling of progress is worth it. 5 looks like a bicycle or snake. This vibration is about calculated risk-taking, conquering fear and creative living. People with strong 5 numerology are passionate go-getters, who never give up. They thrive on change and believe that life is for living. 5 energy, like the number itself, is about balance (see how the number is 50% forwards and 50% backwards?). We are born knowing our life purpose (find your lifepath), and that we are infinite beings with soul contracts to fulfil. * Your throat* not only houses your physical voice, it’s the site of your inner voice and truth (the word INTUITION adds to 50/5). *The throat chakra includes our thyroid gland, ears and hearing – it’s chief language is sound and music. Hint: Once you find your lifepath, you often realise your lifepath number has been following you around, as your house number, phone number, on receipts, clocks etc. What if I’m not a 5 lifepath, but relate to this article? If you have been drawn to this article, you probably have 5’s in your chart or around you (as family and friends). Wherever 5 shows up, is where the Universe wants you to be more flexible, creative and determined. -name/s e.g. Dee adds to 14/5 and Terry adds to 32/5. Archangel Jeremiel is the protector of 5 lifepaths – find your guardian angel. You can also work out your name using Pythagorean numerology here. There are also calculators online, of varying quality. If you have more than a few of these letters (E, N, W) in your birth or current name (including middle name), or more than a couple of 5’s in your date of birth, you are definitely carrying heightened 5 energy. As I have very few 5’s in my numerology, it makes sense that many of my teachers, relatives and friends have this vibration. We complement each other! Without them, I’d be a stick-in-the-mud – without me, they’d forget to slow down, connect and be human (I’m a Master 29/11/2 lifepath, which is about healthy relationships and spiritual growth). -house number, address, phone numbers, licence plates etc. Read more on addresses. I live in a 5 house now (rental) and people are always dropping by – it’s a real social hub. 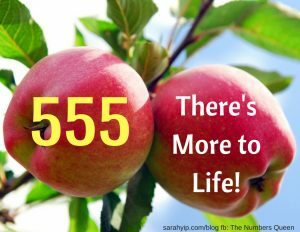 -Seeing 5, 55, 505 or 555 can indicate that you’re halfway towards to a goal, in a cycle of positive change and healing your Throat Chakra (see this article on 11:11 and repeating numbers). It also suggests you have 5s in your lifepath or numerology. I see 555 before I meet my 5 lifepath friends or learn a new topic. That’s why I say ‘555, There’s More to Life’. For this reason, I am not going to disrespect you by repeating myths like ‘all 5s are commitment-phobes who never settle down’. Having read for hundreds of 5 lifepaths, I know this is untrue. 5’s may need their space, but they also love romance and snuggling, as much as anyone else. You are not your numbers – they are your potential. Trust your gut instincts, then use numerology as a second opinion – never the other way around. Otherwise you could delay meeting your Soulmate, just because they don’t have ‘the right numbers’ – what a shame! There’s more to love than lifepaths alone. -5 lifepaths are here to master moderation, so they may flip between staying single and serial dating, especially in their early life. They have a tendency to ‘stay longer than needed’ in jobs or relationships that no longer serve them, perhaps to learn about ‘positive willpower versus self-sabotage’. More on this later in the ‘cons’ section below. -5’s are skilled actors and ‘people people’. Just as the number five is the centre of the numerology grid, 5 lifepaths tend to be the ‘centre of attention’, who attract others easily. They tend to get along with everyone, and rarely have trouble finding a mate (unless they’re recovering from a previous relationship, or workaholics). Read more on releasing your ex. I’m also a fan of these affirmations from Workaholics Anonymous, especially ‘the slower I go, the more I grow’. -It’s important for 5’s to learn assertive speaking and effective listening, so they don’t feel ignored or bullied. Communication is the oxygen of any relationship. When 5 lifepaths get upset, they tend to overtalk (some call this ‘selective or spousal deafness’!!) or undertalk, leading to conflict, frustration and even illness (especially muscle tension, sore throats, and breathing problems – mentioned above). Read about the Five Love Languages and Words of Affirmation. -5 lifepaths can be delightful parents, due to their tolerance, humour, and lifelong curiosity (yes, LEARN adds to 23/5 in numerology). These qualities arise when they are in touch with their ‘inner child’, but can be suppressed if they have been traumatised. Read about healing your inner child and forgiving your parents. The Girdle of Venus often appears in the palms of those who need to heal family issues. I have this, and still see a counsellor and psychologist to stay on track. These traits apply to a lesser degree if 5 is in your name, etc. -You’re a free spirit, and a breath of fresh air wherever you go. No one forgets your impact on their life – 5’s have the ability to inspire and transform people permanently, even after brief encounters. Words like FAIRY add to 32/5, and there’s a magic and light to you, that no one can capture. Countries like BRAZIL, SPAIN and AMERICA all have a 5 energy, these are places of colour, imagination, culture and exploration – see what I mean. -You always get what you want…through charm and/ or conviction. Never underestimate a 5 lifepath – they may seem quiet, but they’re actually a genie in a bottle, full of wisdom and tricks. Even POWER adds to 32/5 – as do the words DRAGON and TIGER. (LION adds to 23/5, as does KING). As I say to my clients, a dragon may look like a sleeping lizard, but invade its cave and it will set you on fire! Similarly, a tiger looks like fuzzy cat, but threaten its cubs and you’re apt to lose your head. It’s far better to have a 5 lifepath as a friend than an enemy – they’ll defend their loved ones to the death, but destroy their foes with lightning wit and intelligence. -You never seem to age. PETER PAN adds to 41/5 in numerology, which makes sense as healthy 5 lifepaths often look younger than their years and stay active well into retirement. They say that you’re only as old as your spine, – when 5’s look after their health, they reap the benefits of a flexible body and mind. I’m often impressed by 5 lifepaths’ photographic memories. Not convinced? Maybe you need to drink more water. Read about hydration and intuition.-People respect your honesty. The best way to describe a 5 lifepath is ‘they sometimes shoot first, ask permission later’. Although they can seem blunt, they’re usually just being truthful. As the saying goes, ‘the truth will set you free’. 5’s are incredibly objective, as children, which means that, ‘what you see is what you get’. They rarely have two faces. Sometimes 5 lifepaths feel like the ‘bad cops’, because they see problems before others do (due to their sensitive natures), however this ability can also save lives. 5 lifepaths have quick minds and reflexes, making them wonderful doctors, healers*, teachers, tour guides, performers, singers, writers and entrepreneurs…they often make a living giving their opinion (which in turn, heals their throat chakra). *Do you have Medical Stigmata in your palms? Find out here. -You’re incredibly psychic, whether you realise it or not. As I mentioned at the top of this post, some of my most significant spiritual teachers are 5 lifepaths – they’ve helped me see life from a totally different point of view, and open up to radical ideas. If you’re a 5 lifepath, always pay attention to your dreams (yes, DREAM adds to 23/5). This is often how Spirit conveys messages to you, especially if you’re busy. More on precognitive dreams. -You have the gift of adaptability. 5’s can reinvent themselves time and time again, at the drop of a hat. They also pick up languages and can be gifted mimics. In Tarot, the fifth card in the Major Arcana is The Hierophant. Traditionally this is a priest or religious educator, who works within the rules to deliver insights and spiritual nourishment. This might sound weird, given that I’ve written 5 is about rebellion and freedom. However it makes sense, when you consider that many 5 lifepaths alternate between periods of escapism and conventionality. It’s not uncommon for them to have desk jobs and unrelated weekend pursuits (e.g. photography or hiking). Of all the lifepaths, I’ve noticed that 5 lifepaths travel the most – whether that’s around the world, in their heads (through study) or through time and space (e.g. astral travelling). The 32/5 lifepaths seem to do well when they work overseas. My Dad’s been around the world many times. -You can be painfully shy. At times, 5 lifepaths may shut down emotionally for no apparent reason. This tends to happen when they’ve experienced a crisis and don’t know how to process their feelings. Due to 5’s quick minds, they tend to mentally move on before their bodies have caught up. This means they can think they’re ‘over something’ (e.g. a relationship) when the grieving’s just started. This can lead to them avoiding social contact (e.g. not answering their phone, and/ or turning to addictions like alcohol or sugar to lower their consciousness). Sadly, this reinforces the problem, because fears are like mushrooms, they multiply in the darkness. At times like this I love Spike Milligan’s quote ‘blessed are the cracked, for they let the light in’. My tip: If you’re a 5 lifepath, keep a journal and write* down your thoughts, especially when your brain seems full. Once you’ve done this, read (or sing!) the words out loud – this process helps you to accept your truth. Just the act of respecting your worries can be enough to let go. If not, then I highly recommend seeing a therapist – Caroline Byrd is someone I’ve worked with for years. *Studies have shown that writing is far more therapeutic than typing when it comes to relieving anxiety. Chanting or music lessons are another way to meet positive people and to reconnect with your heart. -You can be impatient and critical. The number five is linked to the planet and God Mercury/ Hermes. This is a quick-moving energy, which suffers when it’s not flowing. It’s not easy being the canary in the goldmine (i.e. the first one to detect stinky gas leaks, aka the lies that people tell themselves). As a Master 11 lifepath, I know what it’s like to be a Spiritual Messenger too…it’s so frustrating when you can see what others can’t. That said, if everyone was as intuitive as you, you’d be out of a job, right?! Handy Hint: Some people believe that 5 lifepaths are more affected by the astrological event called Mercury Retrograde (though it can depend on whether you were born under one)…this is associated with delays, insights, traffic jams and technical blips – here’s an post on the phenomenon. The current one started 9 April 2017 and lasts until 3 May 2017, however, as a psychic, I feel its effects a fortnight before and afterwards. My joke is that ‘Mercury retrogrades are the only times I see my 5 lifepath friends and clients – it’s when they finally slow down long enough for me to say more than hello’. As a 5 lifepath, you will sometimes attract difficult people and problems, so that you can practice open-mindedness and learn negotiation skills. Be aware of complaining and gossip – this instantly drains your life force (which often results in money problems). Some tips for staying zen under criticism. When I look at famous 5 lifepath Gordon Ramsey (the chef), I see someone who has learned to rein in his temper, so he can genuinely uplift others. You could also say that J.K. Rowling (author of Harry Potter) turned her struggles and frustration as a single mother into a powerful gift to humanity. 1) It may be time to step up your exercise regime – 5’s need more activity than most people (dance and stretching are recommended). 2) Look in the mirror – are there dark circles under your eyes? Maybe you need to ‘do less, and be more?’ 5 lifepaths tend to speed through life, which can manifest as thyroid or adrenal fatigue issues. 3) Review your diet – if you’re eating fast food, it will make you cranky. Not only has the meal been rushed, the people making it are under so much pressure, that you’re swallowing their stress too. Maybe it’s time for home-cooked meals, chewed slowly, with the TV off…a newspaper/ facebook/ phone detox can work wonders for calming our spirits. When I meet a 5 lifepath who is stuck, I always ask about their routine – often they report eating the same meals over, and over again, and having the same thoughts as well. The Throat Chakra loves a varied diet, be that music, food or information. They say that the definition of stupidity is doing the same thing, over and over again, expecting a different result. If you truly want to evolve, why not cook with different spices, try probiotic foods like kefir and kim chi (to increase gut diversity and energy levels), take up hobbies (like writing) and walk a different way home? I also turn on the radio to foreign language channels. Without variety, we get stuck in the prison of our heads, and feel powerless. Use it or lose it. -You may make unusual relationship choices, which are not always in your best interest. While it’s not true that 5 lifepath’s never get married, I believe they need to feel they’ve chosen their partner to be happy. In their early lives, 5’s may let other people talk them into things (including marriage), however by their 30’s they have usually figured out their true values. The challenge is, knowing when to stay and when to go. My tip: As a 5 lifepath, you’re here to provoke people (think Angelina Jolie). Perhaps you are suited to monogamy, or not (think Mick Jagger). Perhaps you are strictly heterosexual, or not (think Ellen Degeneres). Perhaps you believe in marriage, or not (think Elizabeth Gilbert, who wrote a book, Committed, on this subject). Maybe you’re more forgiving than most people (think Uma Thurman, who said “it’s better to have a relationship with someone who cheats on you than someone who doesn’t flush the toilet.”) Perhaps you’ll fall in love with someone decades older than you (think Catherine Zeta-Jones). Who knows?! When you have strong 5 energy, you tend to be less conventional in all areas of life. Some people say that 5 lifepath’s are prone to addictive behaviour (including looking for the perfect mate)…I don’t know if this is true, but I do know that my 5 lifepath clients may feel that their partners ‘block’ them from following their purpose (Dan Millman writes about this in The Life You Were Born to Live). Just remember – this is an illusion! You have two feet, and you can walk forwards or back in life any time.Here is an article on Soulmates to help you decide whether someone’s in your life for a reason, a season or a lifetime.I note that, seeing 11:11 is often a sign that a Soulmate, new spiritual community, and major life changes are on the way, often within five years. Please note: If you are experiencing domestic violence, it’s vital to get professional help – as a survivor of an eating disorder, I know that you can’t see what you’re doing to yourself when you’re in a state of emergency. Here is a post on how letting people down can raise you up. Call 1800 737 732 in Australia for free counselling (1800-RESPECT). Notes: I’ve included significant ‘lifepath age turning points, where possible’. You’ll notice a bias towards musicians, comedians and actors – I’m not sure if 5’s are more likely to go into the arts, but it sure seems that way! A number of them become ‘romantic icons’, which makes sense as 5’s are magnetic and attractive people, due to their youthful spirits. 14/5 Lifepaths (emphasis on ‘1’ independence and ‘4’ heart healing energies) – Clark Gable (actor, Gone with the Wind – despite his heroic roles, he was reputedly a womaniser, smoker, drinker and dieter – note his karmic 14 lifepath which was about learning moderation). Most 14/5 lifepaths these days are children, and need effective ways to express their energies such as sports, music and dance. Healthy diet and sleep routines could help them reach their potential. They’re natural explorers. SNAKE and EVE add to 14/5 in numerology, making me wonder if the Biblical story of Adam and Eve is about wanting more in life than a garden party. Perhaps Eve and the serpent represent true freedom of expression and movement…? April 2017 is a Universal 14/5 Month in numerology, so we’re all dealing with themes of ‘appropriate change’, especially in the financial and health areas now – find your 2017 forecast. Vincent Van Gogh (artist – The Starry Night is so beautiful, I’ve seen it in person and it felt like liquid yearning). My telepathic Dad (I was born when he was 32!! We definitely chose each other). Elizabeth Gilbert (author – the movie version of Eat Pray Love starring Julia Roberts was released when she was 41, sparking a global frenzy). Click on her name for my reading for her. My best advice for lifepath 5’s is to honour your voice, find your audience, and don’t put up with draining situations. Your genius is too precious to waste on whingers, or whinging!! Words like KING, LIFE and APPLE all add to 23/5 in numerology. This energy is about engaging your five senses to have a delicious journey. As a 5 lifepath, you’re here to experience the best of humanity, and the wackiest, while mastering the art of temperance (Temperance is the 14th Major Arcana card in Tarot). Remember, freedom is an internal state, not something that can be bought. Oh yeah – and if you’re blowing people’s minds, you’re right on track! Dear Higher Self, please give me a sign if you’re there? Experience only connection, truth and oneness today, in every possible way (hug yourself and take some deep, slow breaths in and out). This affirmation is best done outside, with bare feet on the ground, skin to skin. I do it in the mornings upon waking up. I hope you’ve enjoyed my take on 5’s! Remember, you can visit my Find Your Lifepath page for similar lifepath guidance. -Share this with other 5’s. Knowledge is freedom! Please maintain integrity by sending them a link to this article. Or, for greater clarity, book a phone or Skype reading with me to discover your soul contract and 2017 forecast. My current waiting list is 6-8 weeks for new clients. it’s worth the suspense – see previous clients’ feedback. Alternatively, please book a Tarot Reading in Brisbane with my husband Kris Anderson. I’m teaching numerology workshops and palmistry workshops in 2017 – bookings are now open.